Scitec Instruments Model 430 and Model 441 are OEM analogue lock-in amplifiers. Both the single phase Model 430 and dual phase Model 441 are suitable for making amplitude and phase measurements but it is significantly easier with the Model 441. 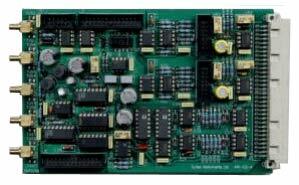 These pcb lock-in amplifiers offer a low cost solution to recovering noisy signals in many situations. Differential or single-ended input Sensitivities from 1 µV to 10 V for 1 V output High performance wide bandwidth input gain stage Low pass filter output time constants from 100 µs to 30 s 1F and 2F reference signal operation 90_ step and fine phase controlA dual phase lock-in amplifier with manual setting, using jumpers, of input mode, sensitivity, low pass filter time constant and reference signal course phase control. Can be used in either of the following three modes:Dual phase operation - one input signal with two demodulators operating 90_ apart providing both X and Y (or real and imaginery) components of the input signal.R calculation - on board circuitry provides the modulus of the X and Y components.Single channel 1F and 2F operation - one input signal and two demodulators operating at 1x and 2x the reference frequency to measure the first and second harmonics of the input signal. Sensitivity: 3 µV to 10 V in 1, 3, 10 steps for 1 V output (Gain settings of x0.1 to x330,000) Reference input: TTL/CMOS with mark/space of 1:10 to 10:1 (triggered from rising edge only) Power: -15 V, 0 V, +15 V dc at 50 mA per supply rail.